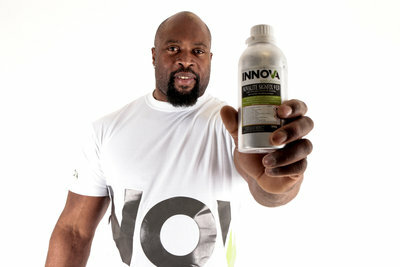 Adhesive and bonding specialists, Innova Solutions, enlist world top ten strongman Mark Felix as the face of their range of high strength products. Mark Felix is the face of Innova Solution's high strength range. UK strongman legend, Felix, has an impressive record in competitive strongman events, regularly placed in the world top ten. Felix is famous for his incredible grip strength and was therefore seen as the perfect representation of Innova Solution's strength range. When adhesive and bonding specialists, Innova Solutions, needed a face to represent their high strength range Mark Felix seemed like a strong fit. UK strongman legend, Felix, has an impressive record in competitive strongman events, regularly placed in the world top ten. Felix is famous for his incredible grip strength and in fact holds the current Rolling Thunder world record. Innova Solutions will use Felix in a series of videos, images and events to promote their NovaSeal, NovaLite, NovaSol, and NovaWeld structural adhesives ranges, all formulated from cutting edge technologies to create versatile, powerful bonding. He’ll also promote the NovaBond range; an eco-friendly, solvent free range of double sided tapes. The campaign playfully places Felix in situations where you would normally use Innova Solutions products, such as commercial sign fitting, or sees the strongman test his strength against and alongside the best from the adhesive firm’s high strength range. Innova Solutions launched the campaign with their very own strongman competition in which Sales Director, Spencer Kelly, faced off against Felix in a number of gruelling events. Glenn Dunleavey is available for further comment. For more information contact press@3manfactory.co.uk or 01772 915005. Innova Solutions have been trading for 14 years. Innova Solutions address is; Lower Draught Gates Farm, Burnley Road, Colne, Lancashire, BB8 8PW. Innova Solutions, renowned for their range of super strength adhesives, were finalists for the Lancashire 2015 Best in Business Awards (BIBAs, www.thebibas.co.uk) in three different categories; Employer of the Year, Small Business of the Year and Excellence in Customer Service. You can find out more about Innova Solutions and Mark Felix on our latest blog: http://innovasolutions.co.uk/blog/2016/06/30/innova-solutions…rongman-approved/. To celebrate Innova Solutions teaming up with Mark Felix, they have a number of offers; free shipping on orders over £150, 10% discount when you order a high strength product that you’ve never tried and a free tin of extra strong mints with every order placed during July.